A strong simple tool for dehorning. One knife does the entire cutting job. This dehorner is smaller and lighter, which makes it ideal for calves up to a year of age. 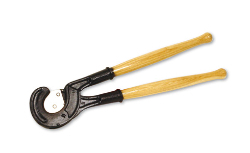 Size: 11 1/2" dehorner with 14 1/2" wood handles.